It was great being able to spend a recent weekend relaxing and taking in one of the finest engineering feats ever accomplished in Pennsylvania at the Bridgeview Bed and Breakfast. 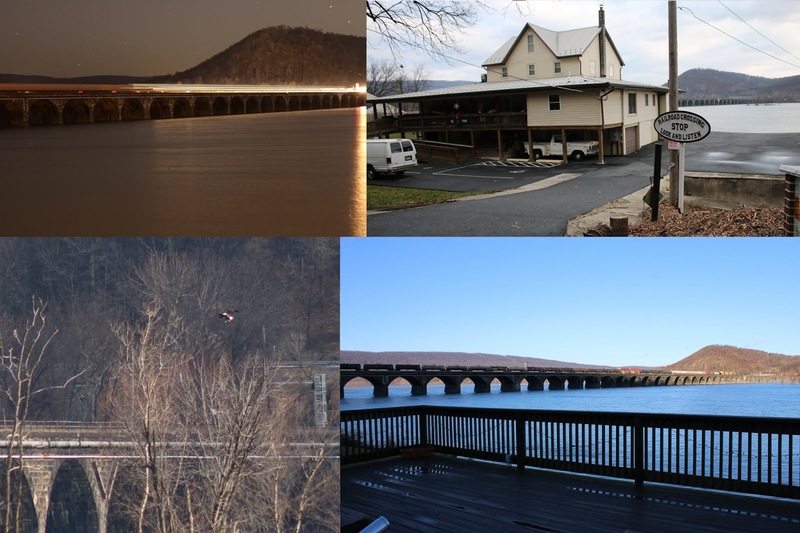 The Bridgeview Bed and Breakfast is located on the banks of the mighty Susquehanna River, just north of Harrisburg. It provides shoreline views of the Rockville Bridge, which is the world's longest stone-arch railroad bridge at 3,820 feet, 117 years after it was initially constructed. For more information on the bridge, check out this article from a previous visit. The construction of the bridge is a revival of earlier forms of railroad construction. The railroad industry was exponentially growing at the turn of the 20th Century and contemporary construction at the time utilized iron for building bridges of this size. The problem was that the growing railroad payloads at the time required the bridges to be able to handle much heavier loads, and many iron bridges at the time were failing. They required constant inspection and maintenance. The Pennsylvania Railroad had outgrown the previous Rockville Bridge, which was dual tracked and constructed with iron. This critical crossing of the Pennsylvania Railroad needed greater capacity and to be able to handle the floods and issues that the bridge would be subjected to. William Henry Brown, Chief Engineer of the PRR at the time, decided that the best way to address the problem of increased rail traffic and weight issues was through going back to a technology that was more commonly used at the beginning of railroading, stone masonry construction. Across the entire Pennsylvania Railroad Mainline, they utilized stone masonry construction to replace the old bridges across the line. In turn, this added reliability to the line would prepare the line to carry the supplies and products necessary to propel us to victory in World Wars I and II. The Germans knew the importance of this bridge and attempted to attack it during World War II. Their plot was foiled, but that shows just how important this bridge was. The fact that this bridge has handled rail traffic almost daily since construction is a huge testament to the quality of its construction. Even during a failure of one side of a span in 1998, the bridge was still strong enough to be used on the other track. While we have stopped many times to watch the bridge, it was great getting to watch it overnight while staying at the Bridgeview Bed and Breakfast. The rooms were cozy, the hosts were kind and knowledgeable, and the location cannot be beat. If you are planning on spending some time in the Harrisburg area, this Bed and Breakfast is a great place to go to. It is within 15 minutes of anything within Harrisburg, and within 30 minutes of all of the attractions in the Hershey area. The Bed and Breakfast has this wraparound deck that gives great views of the bridge and river. This Bed and Breakfast is known as one of the finest accommodations for people who are rail fans. The view from the deck. It is such a great place for anyone who loves the outdoors. 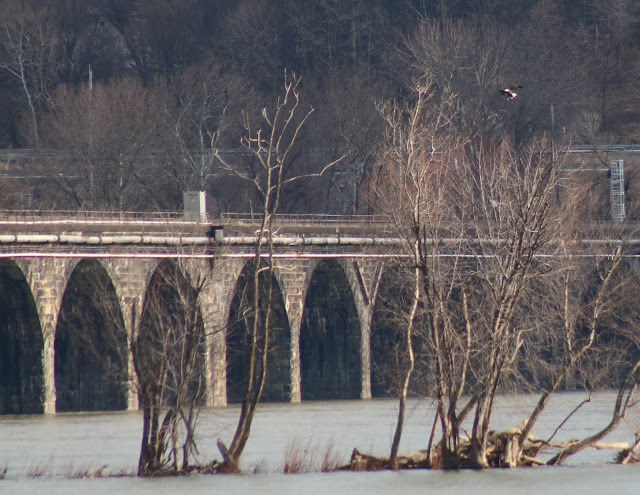 Aside from the railroad and engineering beauty of the bridge, you will be certain to see many raptors, including eagles, hawks, and waterfowl including herons, and more. Sunrises and sunsets are especially beautiful, with views up and down the river. Note the third NS locomotive is a former BNSF locomotive. We saw a few of these units throughout the weekend. Approaching sunset! It is neat seeing the angles of the sun through the shadows from the surrounding valley. There is a total of 48 spans that are 70 feet long by 52 feet wide. It is really a sight to behold, even for people that are not into bridges or railroading. The harsh angles and shadows at sunset highlight the various colors on the bridge. Some old coal cars, with the first one hearkening back to the bridge's days under Conrail. Today the bridge it utilized by Norfolk Southern and Amtrak. Just down the road you can get a look at Norfolk Southern's Enola Yard. This once was the world's largest rail yard. While operations are greatly diminished, it still gets lots of traffic. A road bridge that crosses the northern end of the yard has window-like openings in the fence for rail fans to enjoy views of the traffic in the yard. The sunrise trying to peek through the clouds. Breakfast time! The French Toast and Sausage hit the spot. A picture window gives a sweeping view of the bridge that you can take in while you eat. Additionally, there are cozy common areas, complete with a computer that shows the coming trains. The sun breaking through the morning clouds. Back to the trains. Seeing two come at once is pretty neat. 21st century logistics carried by a tremendous and durable piece of early 20th century infrastructure. A true testament to the American will. UPS Ground and FedEx Ground efficiently traveling on the same train. Instead of all of these trailers and containers being carried across the country inefficiently by individual tractor trailers, railroading carries our freight in a more efficient and environmentally friendly manner. It is neat to watch this in action. Overall, we highly recommend checking out the Rockville Bridge and the Bridgeview Bed and Breakfast. It is a cozy, relaxing, and exciting place to stay.